I received some handmade gifts a while ago, one of which was a gorgeous pearl accessory set consisting of a choker and a pair of earrings. They were gorgeous and so well turned out – and it was the first time I’d known of Sweet Contemplation Accessories. 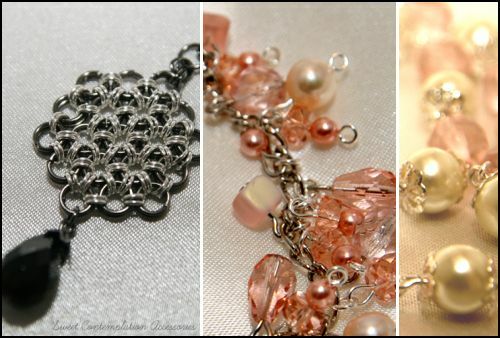 Sweet Contemplation Accessories is a new handmade jewelry line operating out of Australia and I’m proud to say, owned by fellow blogger and friend Tine of Beautyholics Anonymous. I’ve known Tine for a while now since our pre-beauty blog days (we were known merely as bloggers then and I went for her wedding! 😀 ) and I never once guessed at her talent. To say I was gobsmacked is an understatement. 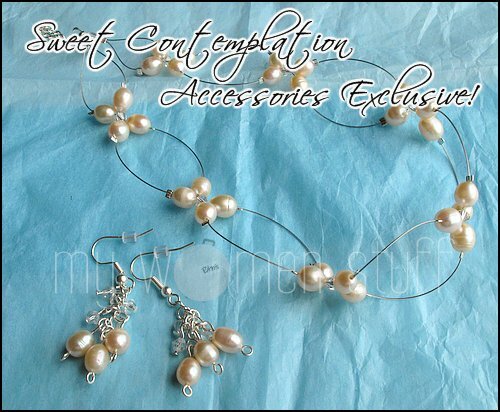 You won’t find the pearl set she made me on her site though – its a Sweet Contemplations Accessories Exclusive 😉 but you can find a whole host of other pretty accessories there. Her style is pretty, feminine and whimsical and above all, unique. So much so, browsing her site has led me to a purchase of 3 items from there last week 😛 I’m informed they have been shipped and I can’t wait till they get here. I had to get the bracelet shortened though which Tine kindly obliged. Sweet Contemplation Accessories accepts credit cards and best of all, Paypal. You might have read that you can now link up your Malaysia bank accounts to Paypal so that makes it a whole lot easier to shop online now! Bad for the wallet, great for online shopping! Now tell me which item you are eyeing from Sweet Contemplation Accessories? A necklace? Bracelet? Earrings? All of the above? PREVIOUS POST: Random Ramblings: Smashbox in KL, Diamond Botan Brush, Guerlain Christmas 2009 and more! the bracelet looks FAB! 🙂 Tine is really talented! Tine is so talented! Her jewellery is beautiful!